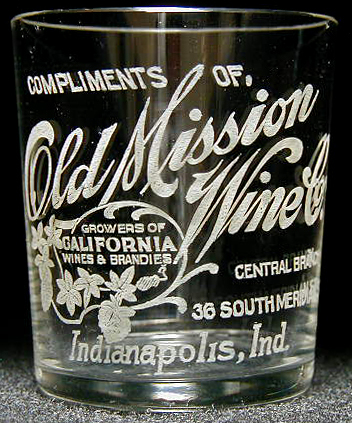 Inscription: COMPLIMENTS OF (ital) / Old Mission (slanted script) / Wine Co / CENTRAL BRANCH / 36 SOUTH MERIDIAN ST. / Indianapolis, Ind. Dimensions: 2-1/16" x 1-11/16" x 1-1/2"
Condition: There are multiple small chips on the rim surface but nothing visible when on display. The label is very strong -- no other issues! Great display glass!